Meacher: Tony Benn's "vicar on earth"? 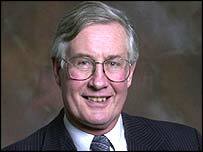 Michael Meacher is one of Labour's longest serving MPs, having first been elected in 1970. He is also Labour's most experienced minister, having served in various roles throughout the Wilson and Callaghan administrations in the 1970s, in addition to being environment minister since 1997. The zenith of his career, however, came during Labour's opposition years when he sat in the shadow cabinet for fourteen years and was tipped as a future leader. He was formerly on the left of the party, and a close political colleague of Tony Benn. He stood as the left's candidate against Roy Hattersley for the deputy leadership of the Labour party in 1983, but was soundly defeated. Former Labour leader Neil Kinnock once described Mr Meacher as Tony Benn's "vicar on earth". He couldn't bear the left-wing firebrand and only despised him more when he moved away from his old mentor. But Mr Meacher kept on getting elected to the shadow cabinet by Labour MPs and, under the rules of the day, Mr Kinnock could not sack him. Only once Labour was elected to office did the leader have the right to form his own cabinet. And Mr Kinnock made no bones about the fact that, minutes after entering Downing Street, he would re-shuffle the team which had been dumped on him - and out would go Mr Meacher, amongst others. But the Oldham MP proved remarkably resilient. He survived into government when Mr Kinnock didn't, and was even given a job by Tony Blair, who takes a much more charitable view of him. Since then he has gradually moved closer to the political centre, though he remained one of the most radical members of the government. In August 2002 he ruffled feathers by attacking his government's record on the environment. Who's who in the cabinet?